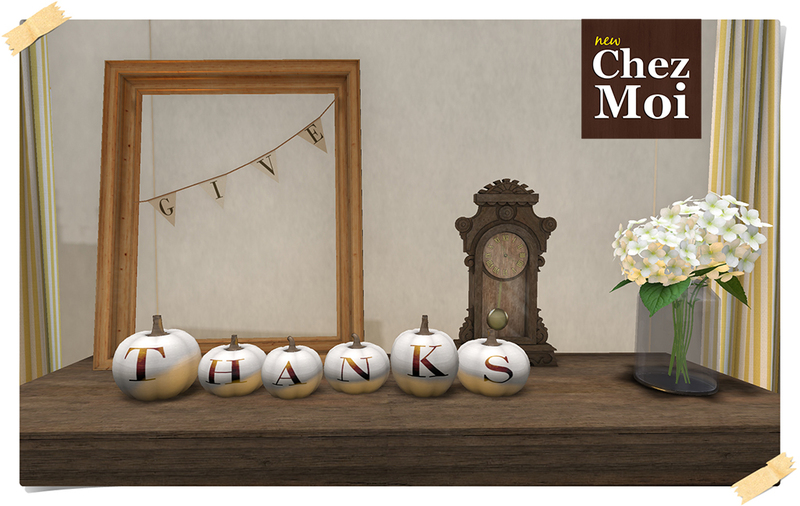 This living room is also perfect for decorate your home for Thanksgiving or for Fall style. 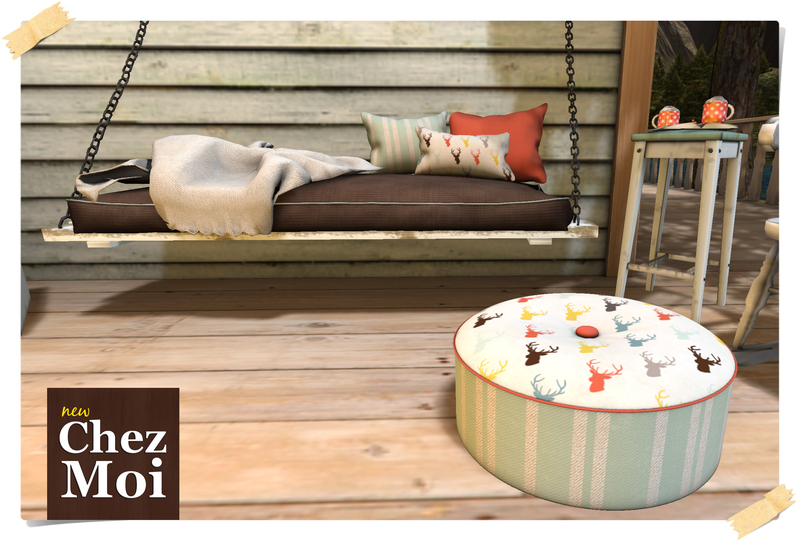 Cold Breeze and a cozy place is perfect to enjoy a delightful day with your friends. 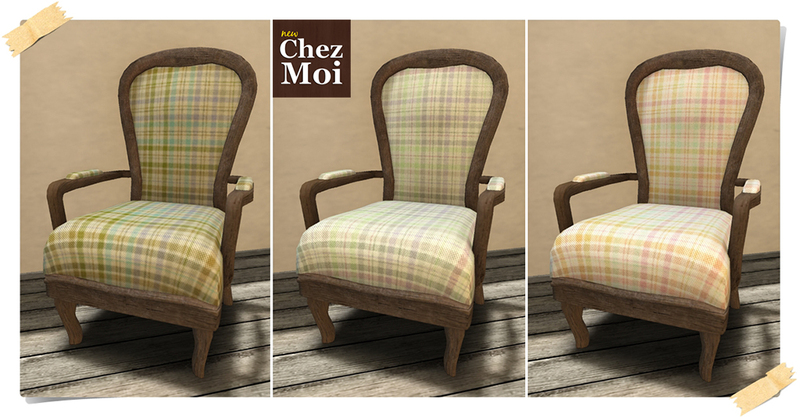 This fully interactive set, perfect for porches, will amaze your guests and visitors. ♥ Several “wearable” props as book, bubble blower, phone, newspaper, guitar and a delicious cheesecake. 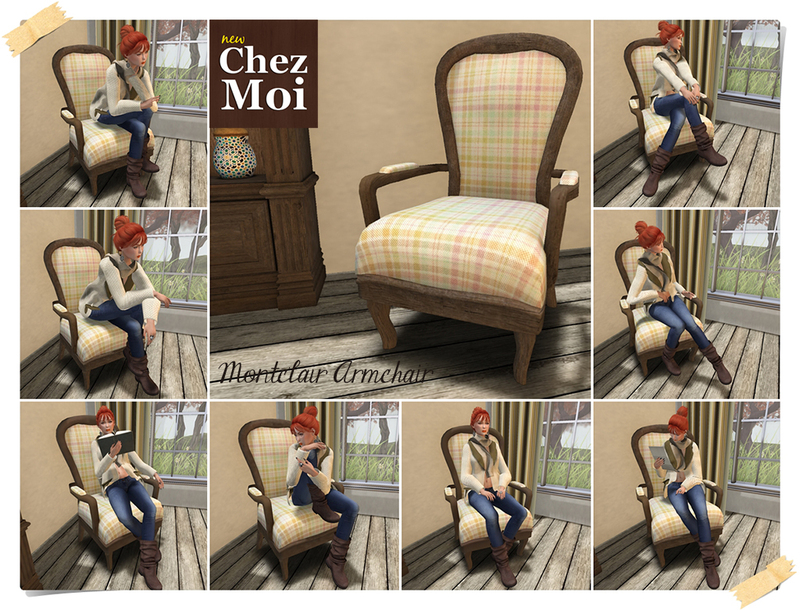 The vintage Rocking chair comes with 20 animations. 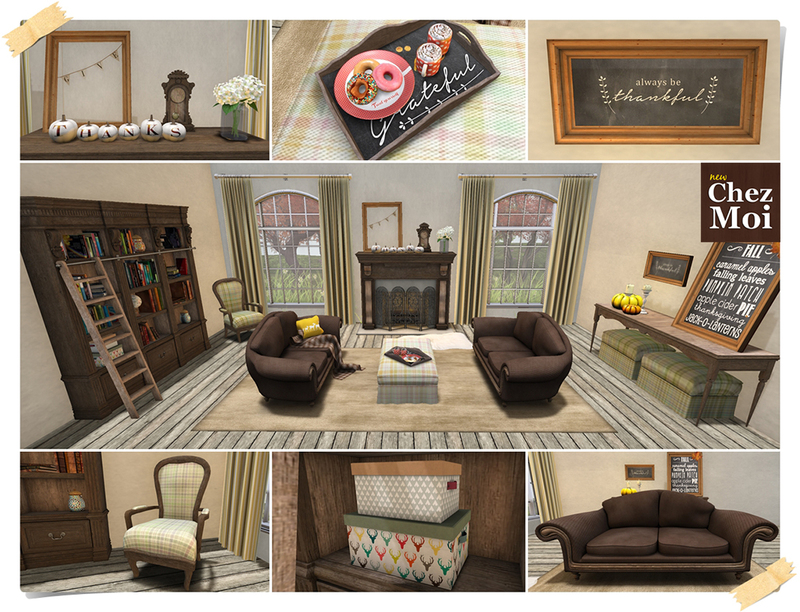 The gracious ottoman has 12 animations and the stool and books that decor the scenes comes with a surprise: touch the book to get a hot beverage. 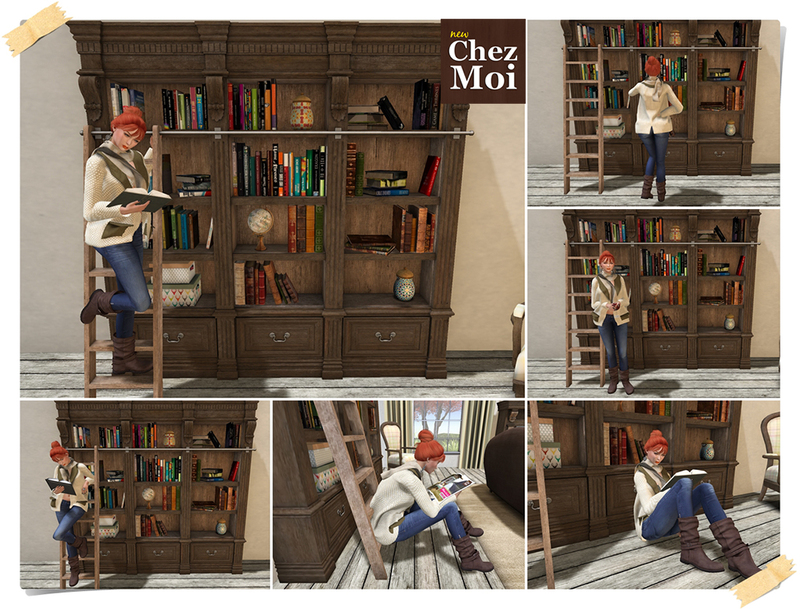 Check more informations in CHEZ MOI MARKETPLACE (PG VERSION and ADULT VERSION) or, for a closer look, visit the INWORLD STORE. 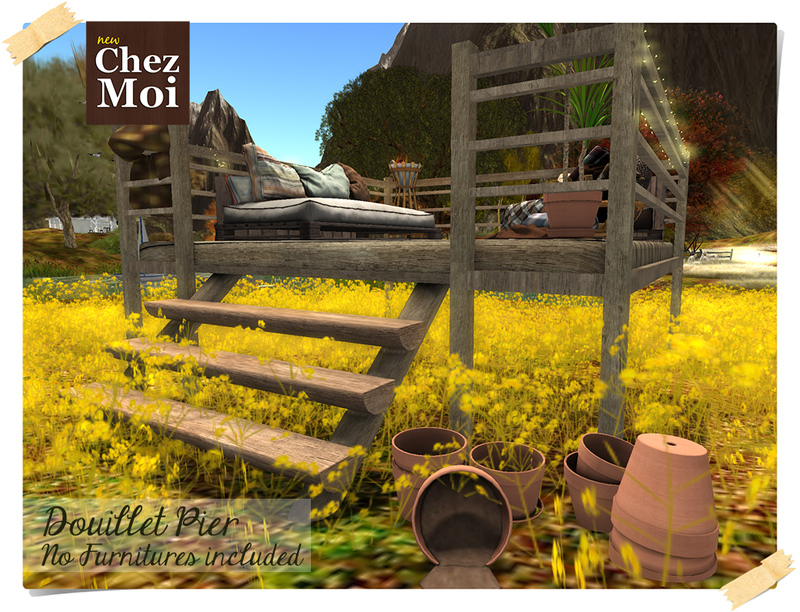 Enjoy the season and have a wonderful outdoor day with this fully interactive mini farm CHEZ MOI. ♥ Props: book, mug, guitar, newspaper, corn, wine, bubble blower etc. 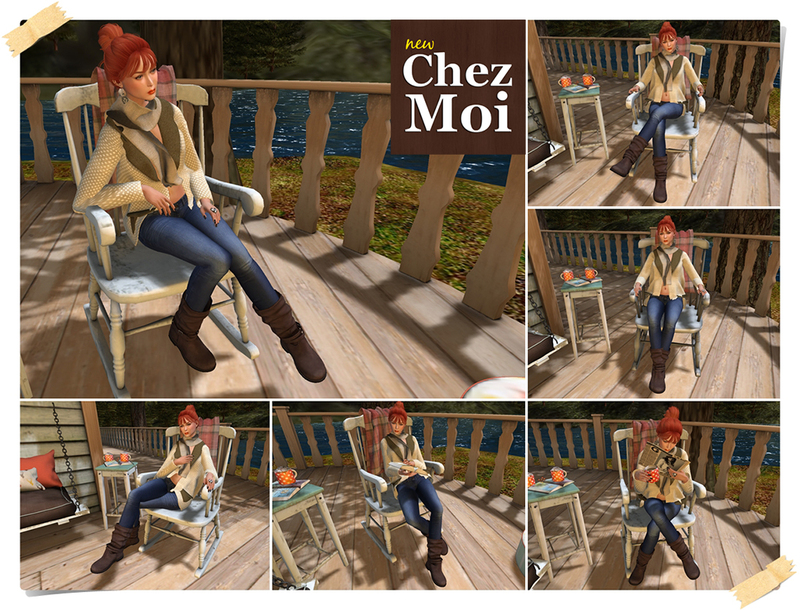 The scenery as seen in the photo features 48 LI | 47 Prims. Have a good time and enjoy the season! Ghosts and goblins, scary witches and spooky galores… It’s Halloween! 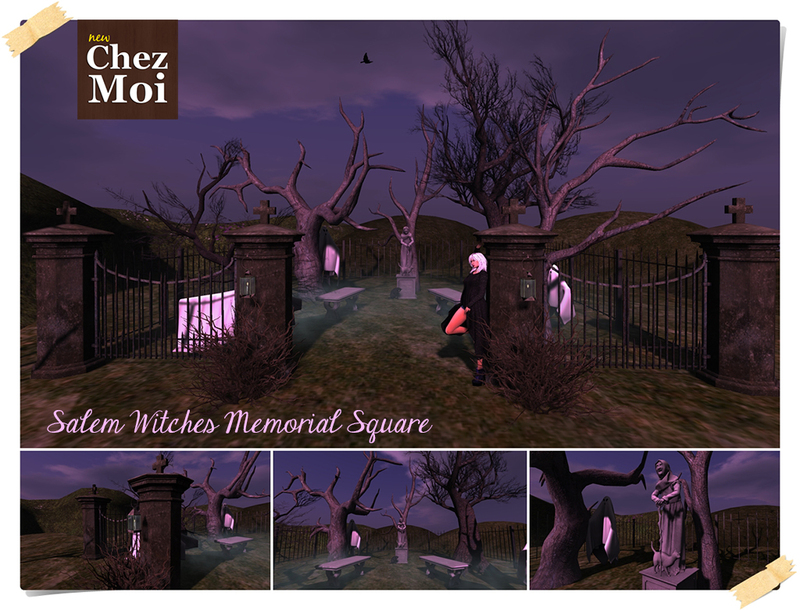 This fully interactive Square will surprise your guests and visitors with numerous animations and a creepy soundtrack! 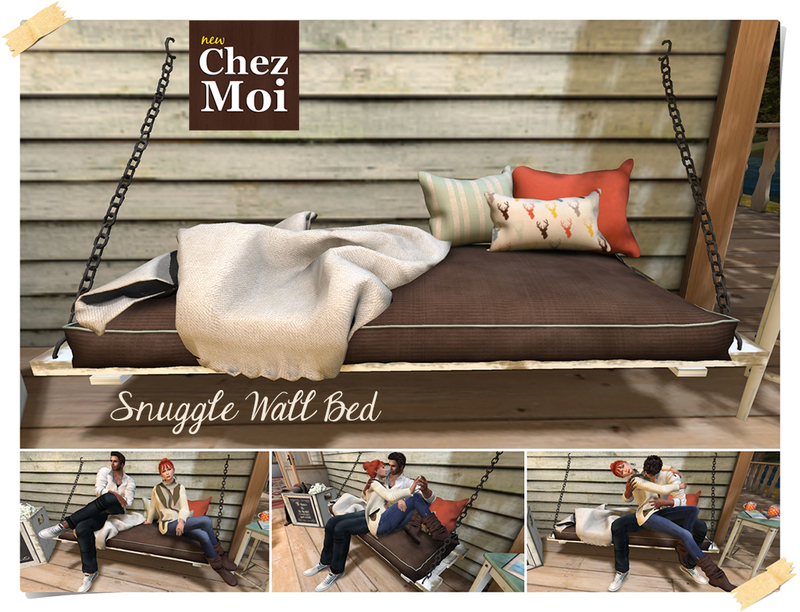 ♥ It has 8 nightmares sounds on shuffle that you can control by menu – just click on the fence to display it. 3 FLOATING GHOSTS that make the scenario even more frightening. Have fun and a Haunting Halloween! Textures and mesh carefully chosen to make the real environment. 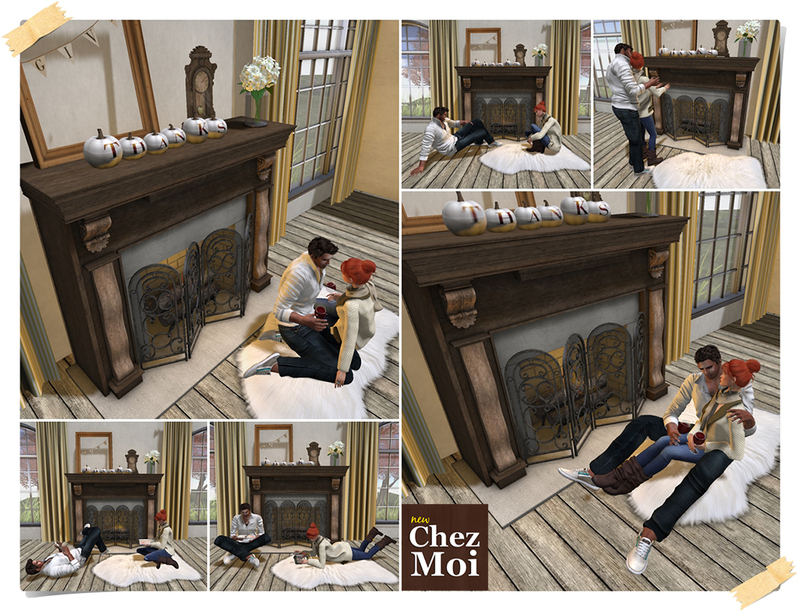 Douillet means comfortable, cozy in French and perfectly represent this interactive Pier with furnitures multi poses, great to gather friends and decorate your garden or parcel. 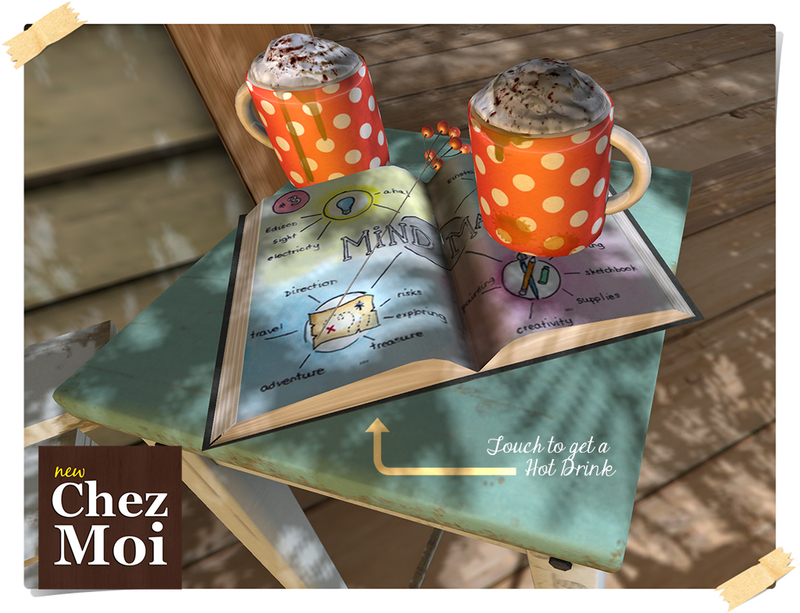 ♥ Props: book, mug, guitar, newspaper, tablet, bubble blower etc. ♥ Props: book, mug, guitar, bubble blower etc. 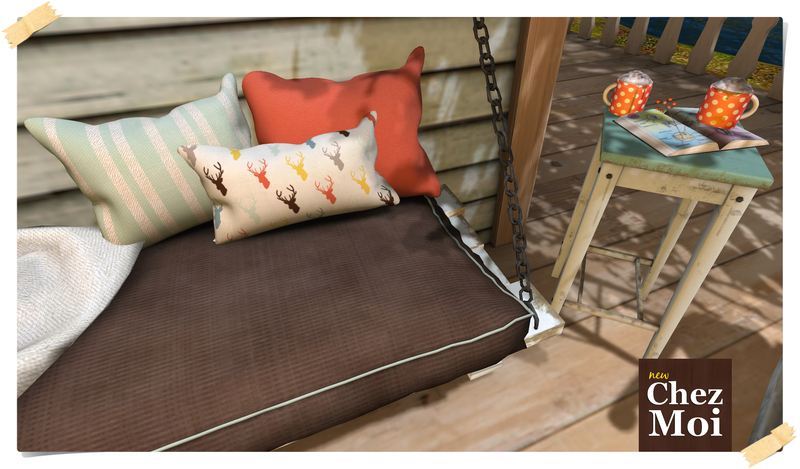 The Hanging Blanket at Pier has 16 female and male animations and comes with some “wearable” props. 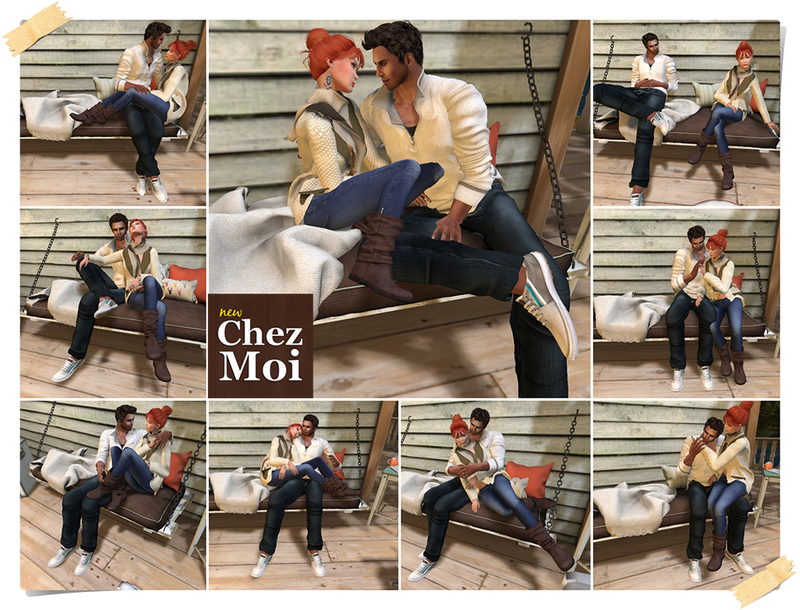 ♥ Texture-Change Options: 3 combinations to choose from a menu. 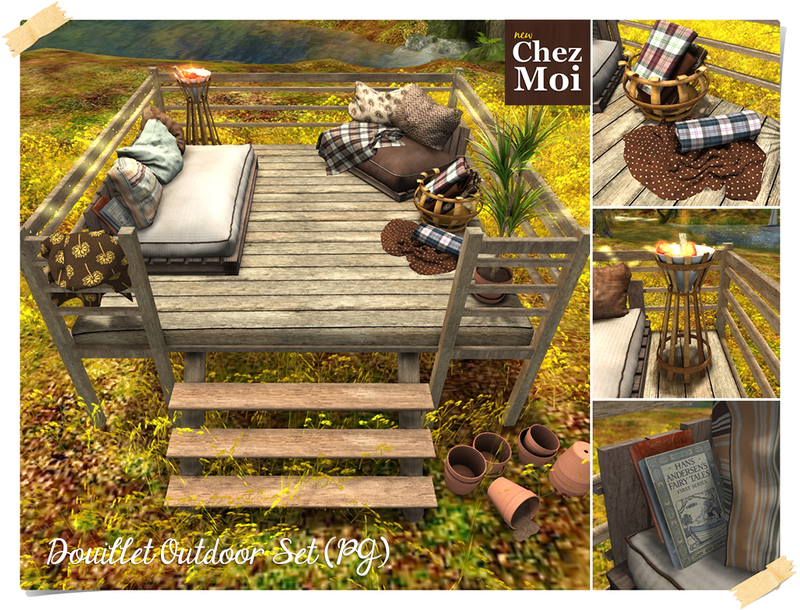 The scenery as seen in the picture has 38 LI | 52 Prims – Very low impact on the land.